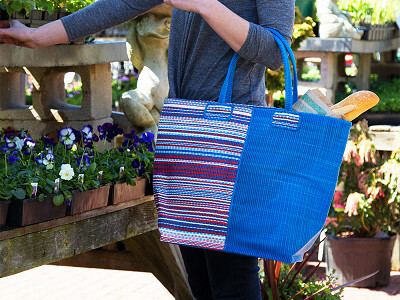 If you’re on your way to the beach or grocery store, grab a tote from Swahili African Modern. These durable, upcycled bags are made by African artisans who are paid a fair wage. 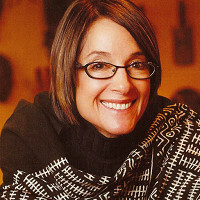 Founder Leslie Mittelberg lived in Kenya over twenty years ago, where she was captivated by local crafts and art. To widen their market, she created Swahili African Modern, whose Fair Trade practices ensure fair pay to improve artisans’ lives. Swahili’s totes are made with leftover material from Senegalese prayer mats, which are factory-woven from strands of bright, durable plastic. Widely used in Africa, these mats let families sit and have a meal or work on their crafts. The UN has even used them for refugee sleeping mats. The extra material from the factory is hand-stitched into colorful totes by Swahili’s skilled craft workers. Fill one up at the farmer’s market, and feel good knowing it benefits African artisans and their families. Hi, I'm Mackenzie from Swahili African Modern. We're so excited our totes from Senegal are today's Grommet! I would love to answer any questions you may have about these colorful tote bags that are a favorite of tourists visiting West Africa. @celina Hi Celina! The bag does not have a closure, nor are there any interior pockets. All great ideas however! The size of the bag is 20" x 8" x 15" and it is available in pink, silver and blue. You can view images of the various colors by clicking the + symbol above in the BUY link. @Mary Hi Mary! We work with each of our artisan groups to come to an agreed upon cost per piece and they are in turn compensated for each piece produced. We factor the materials and labor cost into the final figure and offer fair payment, substantially higher than what they receive by selling in their local markets. 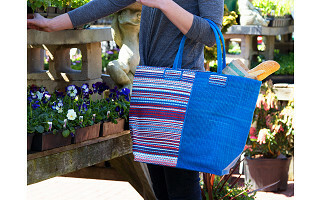 If you’re on your way to the beach or grocery store, grab a tote from Swahili African Modern. These durable, upcycled bags are made by African artisans who are paid a fair wage. Founder Leslie Mittelberg lived in Kenya over twenty years ago, where she was captivated by local crafts and art. To widen their market, she created Swahili African Modern, whose Fair Trade practices ensure fair pay to improve artisans’ lives. Swahili’s totes are made with leftover material from Senegalese prayer mats, which are factory-woven from strands of bright, durable plastic. Widely used in Africa, these mats let families sit and have a meal or work on their crafts. The UN has even used them for refugee sleeping mats.